NASA announced that it was planning on sending a aeroplane over to Mars to run flights over the Southern Hemisphere in order to collect data spanning over 4 billion years of Martian history. The unique mission would be the first of its kind, costing many millions of dollars for each flight. On hearing this, the low-cost British Flight operator Easyjet stepped in and promised to do the flight for £99.99 with a free return thrown in if you booked online. They also stated that they would provide far more luxurious transport onboard their 747’s than NASA could on their specially designed unmanned drones. 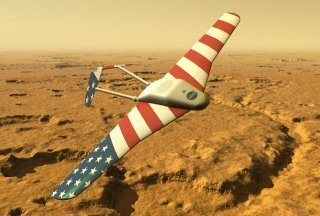 The Ares Plane is an automated drone that NASA intends to fly over Mars. An Easyjet spokesperson commented on NASA’s designs: “I know that NASA has specially designed these drones to be pilotless and they’ve done an excellent job in developing the technology – but they’ve neglected the important issue of passengers. Their drones have no passenger space whatsoever which means that their passengers would have to straddle across the back of the drone like a passenger on a motorbike and that would severely impact the carefully developed aerodynamics. 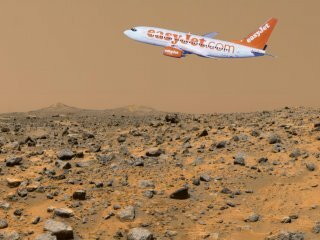 Easyjet intends to send a fleet of passenger aircraft to Mars in a bidto compete against NASA.